Figure 1. Refurbishing of automobile headlamp with high performance UV technology. Ultraviolet (UV) coating technology is widely used for decoration and protection in many different applications in a wide range of industries. The environmental benefits of UV technology are well documented for the reduction of emissions of volatile organic compounds (VOCs) and hazardous air pollutants (HAPs).1,2 Additional advantages of this environmentally friendly technology include faster cure, increased production speed, improved process efficiency, source reduction and sustainability. Fast curing under UV lamps eliminates the need for ovens or extensive manufacturing space for drying of coatings, with corresponding savings in energy costs and infrastructure. UV technology can provide a healthier work environment and can decrease risks and lower insurance costs by eliminating flammable solvents from coating processes. Regulatory costs can be significantly reduced with UV technology, which can provide lower applied coating cost and reduced overall cost through improved process efficiency and elimination of pollution. The capabilities of UV coating technology have been extended to the high performance protection of a variety of surfaces. The requirements of UV cure do not prevent this technology from providing surfaces with UV protection and resistance to weathering from sunlight. UV technology also provides toughness, solvent resistance and abrasion resistance for many different substrate materials. For metal surfaces, including steel and high strength aluminum alloys in industrial and aerospace applications, UV coating technology provides this protection along with superior corrosion resistance. When compared to conventional coating technology, high performance solvent-free UV-curable coatings provide improved protection with dramatically faster cure and lower material usage, and UV technology provides this protection in addition to improved manufacturing efficiency and environmental benefits. High performance UV coating technology can provide improved UV absorbance compared to commercial conservation glass that is designed to protect artwork from sunlight. Whereas the conservation glass provides good protection for the UVA band wavelengths, the clear UV coating provides improved protection through UVA, UVB and UVV bands as shown in Table 1, and can provide this UV protection for a wide variety of surfaces. The toughness, solvent resistance and abrasion resistance of UV coatings are ideal for high performance flooring applications, and the efficiency of UV technology can provide a significant reduction in the time required to apply a high performance coating to a floor and to cure the coating and put that floor back into service (Figure 2). Abrasion resistance for a UV-curable floor coating can be significantly improved over that of typical epoxy floor coatings (Table 3), with a dramatic reduction in cure time with the UV system. Solvent resistance properties for high performance UV-curable floor coatings are excellent and can be tailored to the requirements of the application. Table 4 shows the results of solvent resistance testing using standard chemicals. Corrosion is a tremendous problem and cost to society. More than a decade ago, as part of the Transportation Equity Act for the 21st Century, the United States Congress mandated a comprehensive study to provide cost estimates and national strategies to minimize the impact of corrosion. The study was conducted by CC Technologies Laboratories Inc. of Dublin, Ohio, with support from NACE International -The Corrosion Society and the US Federal Highway Administration (FHWA). This study titled “Corrosion Cost and Preventive Strategies in the United States” is the most comprehensive reference on the economic impact of corrosion, estimated at the time to be a staggering annual cost of $276 billion. According to the study, reported to the Office of Infrastructure Research and Development, corrosion and metal wastage arising from oxidation – as caused by exposure to the elements and reactivity between dissimilar materials – costs many segments of the United States economy billions of dollars every year, including aircraft, motor vehicles, bridges, gas and liquid transmission pipelines, water and sewer systems, electrical utilities, ships, railroad cars, petroleum refining, pulp and paper processing, food processing and home appliances.4 The US Government Accounting Office (GAO) now reports that the annual cost of corrosion in the United States has grown to $400 billion. Epoxy and polyurethane paints are the commercial materials that are typically used for high performance corrosion-resistant applications, with epoxy paints used as primers and used in applications where maintaining color and appearance are not as critical, and polyurethane paints generally used as topcoats and used in applications where color and appearance must be maintained. These paints can only be used in a relatively narrow temperature range and can present many disadvantages, including corrosive or toxic components in two part systems that must be mixed and have a limited pot life with viscosity continually increasing until full cure. There is commonly an extended period of time of before full cure is achieved, especially at low temperatures. Pollution is a significant disadvantage of commercial high performance paints for corrosion resistance, since these materials typically contain solvents, VOCs, HAPs and, in many cases, chemicals on the Toxics Release Inventory (TRI). Urethane paints contain isocyanates – a significant health hazard – and many paints for corrosion resistant applications contain chromium compounds, which also represent a significant health hazard. Not only are polluting compounds and health hazards problematic for the use of these commercial paints, but performance of these systems is sometimes lacking with regard to corrosion resistance. When epoxies are used as the complete paint system for corrosion resistance, performance disadvantages can include brittleness and poor weatherability, with yellowing and changes in gloss with exposure to sunlight. When polyurethanes are used as the complete paint system for corrosion resistance, performance disadvantages can include poor adhesion to metal surfaces. To avoid performance disadvantages of the two individual systems, these materials are often used in high performance applications as multilayer systems, with epoxies as the primers containing corrosion inhibitors and providing adhesion to metal substrates, and urethanes as topcoats to provide appearance properties of color and gloss that are more stable to sunlight and weather. By formulation with urethane acrylates and chromium-free corrosion inhibitors, high performance corrosion protection has been demonstrated with solvent-free UV coating technology. For example, accelerated corrosion testing on steel has shown that superior corrosion resistance can be obtained with high performance UV coatings, as compared to conventional epoxy and urethane corrosion resistant paints having much higher thicknesses. UV cure is complete within seconds, and improved performance is obtained using 100% solids UV technology with significantly lower material usage and coating weight than conventional coatings (Table 5). The corrosion resistance properties of conventional systems also can be improved by adding a UV coating layer as a topcoat (Table 6). With improvements in the technology of portable handheld UV lamps, field application and cure of high performance corrosion resistant UV coatings is possible for even the largest of structures, with a UV lamp passed over the surface slowly in the same manner as a surface is painted with a spray gun or roller. Just as any surface can be painted with only a few individuals spray-painting or rolling, a UV coating can be applied and cured on that same surface by only a few individuals applying paint and following with a UV lamp. An efficient process can be performed with one person applying paint and another following with a UV lamp, each with proper protective shielding as shown by the painters in Figure 3. Cure is achieved with a motion that can be described as “painting” the surface with the handheld UV light, passing the light over the surface slowly in the same manner as a surface is painted with a roller or spray gun, with the movement of the lamp taking approximately the same amount of time as applying paint to the surface. With complete final properties obtained in a matter of seconds under a UV lamp, this fast cure presents a tremendous advantage in expanding the conditions in which it is possible to conduct painting operations for field-applied coatings. Cure within seconds provides many advantages, including time savings and improved efficiency and higher quality coatings due to the elimination of long cure periods when temperature, humidity or other factors could cause damage to uncured coatings. In addition to complete cure at low temperatures that is currently impossible with conventional paints, it is also possible to apply and cure UV coatings even when rain is expected shortly. This is especially advantageous at hot summertime locations where conditions are often ideal in the morning and rainy in the afternoon. With UV technology, after UV cure the coating has full properties and will be unaffected by rain, unlike conventional materials. MUV coatings have demonstrated good compatibility and excellent corrosion protection for aluminum alloys with a number of different surface treatments. High performance MUV-coating technology has satisfied major requirements of aerospace primer specification MIL-PRF-23377 and aerospace topcoat specification MIL-PRF-85285, including low gloss camouflage appearance, good adhesion, hardness, solvent resistance to methyl ethyl ketone (MEK) and Skydrol® hydraulic fluid, and excellent ASTM B-117 corrosion resistance, with the scribe lines of 2024-T3 aluminum alloy panels remaining shiny after 3000 hours of salt fog testing (Figure 5). These high performance properties are obtained with immediate cure using a high irradiance UV lamp, and in the complete absence of any solvents, VOCs, HAPs, isocyanates, chromium compounds or any hazardous materials whatsoever. Similar properties are obtained using low irradiance handheld UV lamps. For comparison, an unprotected aluminum alloy corrodes very quickly (Figure 6). In addition to providing manufacturing efficiency and environmental benefits, UV coating technology provides excellent protection for surfaces, including UV protection and resistance to weathering from sunlight. UV technology also provides toughness, solvent resistance and abrasion resistance, along with corrosion protection for metal surfaces, including steel and high strength aluminum aerospace alloys. When compared to conventional technology, high performance solvent-free UV-curable coatings provide improved protection with dramatically faster cure and lower material usage. Clean and green UV technology not only improves efficiency in many manufacturing processes, but also addresses important societal issues, such as sustainability and the need to improve health aspects of high performance coatings, reducing VOCs, HAPs and other pollution. UV coating technology provides safer and more efficient alternatives for corrosion resistance in important markets representing major infrastructure of the United States, including vehicles, bridges, storage tanks and piping. Dr. Ben Curatolo is president of Light Curable Coatings in Berea, Ohio, specializing in UV technology for high performance industrial and aerospace applications. Curatolo has a chemistry degree from John Carroll University and a Ph.D. in polymer science from The University of Akron. He has authored several chemical and polymer encyclopedia articles, and he has 37 US patents in his name. He is a member of many technical organizations, including the BP America Inventors Hall Of Fame. RadTech Technical Committee, “UV/EB Technology: A Way to Reduce Greenhouse Gas Emissions,” RadTech Report, pp. 12-13, May/June 2005. Ronald Golden, “Low-Emission Technologies: A Path to Greener Industry,” RadTech Report, pp. 14-18, May/June 2005. Guarav Sharma and Raja Bala, editors, “Digital Color Imaging Handbook,” Boca Raton, FL, CRC Press, p. 31, 2003. “Corrosion Cost and Preventive Strategies in the United States”, Report No. FHWA-RD-01-156, CC Technologies and NACE International, September 30, 2001. 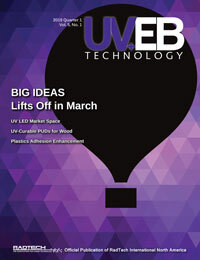 Ben Curatolo, “UV Technology For High-Performance Industrial Applications,” RadTech Report, pp. 24-27, Fall 2011. Matthew J. OKeefe, William G. Fahrenholtz, and Ben S. Curatolo, “Multifunctional UV (MUV) Curable Corrosion Coatings for Aerospace Applications”, Metal Finishing, pp. 28-31, February 2010. Matt OKeefe, “Corrosion Finishing/Coating Systems For DoD Metallic Substrates Based On Non-Chromate Inhibitors And UV Curable, Zero VOC Materials,” SERDP Project WP-1519 Final Report, August 2010.